A fan favorite all around! 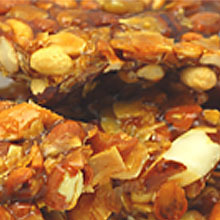 Try our sweet, buttery brittle blended with peanuts, cashews, brazils, almonds, coconut, walnuts, filberts and macadamias. Perfect blend of nutty crunchy flavor. Price quoted is per pound, not including shipping.